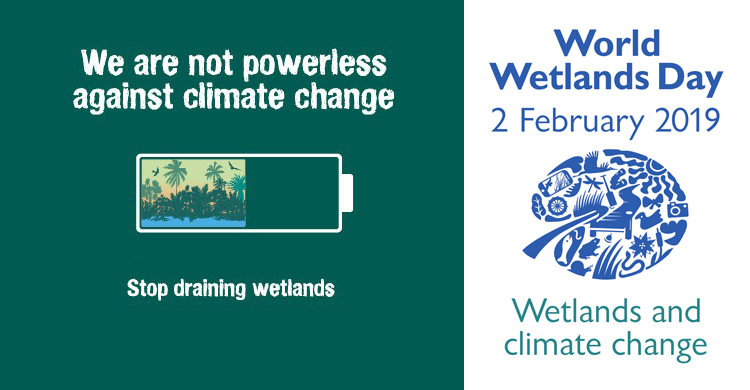 Bonn, 1 February 2019 – Tomorrow is World Wetlands Day, organized as ever by the Ramsar Convention and this year being conducted under the slogan “we are not powerless against climate change”. Wetlands are not only important as waterbird habitat, which explains why AEWA and Ramsar work so closely together, but their natural power can be harnessed to help in the fight against climate change. Peatlands store almost a third of terrestrial carbon (more even than the world’s forests) and this despite only representing three per cent of the planet’s surface. Salt marshes, mangroves, sea grass beds all play an essential role in storing carbon, absorbing the shock of storm surges, reducing flooding and counteracting droughts. This year’s theme is particularly relevant to the Resolution adopted at last year’s Meeting of the Parties to AEWA on Climate Resilient Flyways (Resolution 7.9) and to the project “Climate Resilient Site Network in the African-Eurasian Flyway” The project is being funded through the German Federal Ministry for the Environment, Nature Conservation and Nuclear Safety’s International Climate Initiative and implementation is being led by Wetlands International. “Having lost 33 per cent of our wetlands in the past 45 years, we really must acknowledge how important the remaining ones are. I congratulate our colleagues in the Ramsar Convention for conducting this vital awareness-raising campaign and I wish you all a happy “World Wetlands Day,” said Jacques Trouvilliez, Executive Secretary of AEWA. World Wetlands Day has been observed annually since 2 February 1997 to mark the anniversary of the signing of the Ramsar Convention (the Convention on Wetlands of International Importance especially as Waterfowl Habitat) in the Iranian city of Ramsar in 1971. The convention is a treaty, the aim of which is to preserve wetlands and promote their sustainable use.